We experience so much life when raising our kiddos: joy and suffering, happiness and sorrow, laughter and tears. The emotional yin and yang of our motherly moments are constantly in flux, yet always adding a profound richness to our world in all its uncertainty. One aspect of family that remains a constant, bringing peace and harmony to our inner dynamic is the love of our beloved pets. Our furry friends offer an unconditional flow of adoring—a unique life force and peaceful undercurrent to daily life. Watching our kids learn to nurture, interact, and love up a pet is a special added bonus for us a mommas. We get a beautiful glimpse of how our sons and daughters will be as future husbands, wives, and caretakers when they grow up. The flip side of the joy is the heartbreak of having to say goodbye, especially if our family pet has been a fixture for a very long time. Our dog, Charlie, became a part of our family back in 2008. The hubs and I adopted Charlie from a foster family who had rescued him from a mean puppy mill. Charlie was 3 years old when he met his brothers and sister for the first time as part of a surprise Christmas gift. Once his four paws landed on our family room floor, the Spear family was never the same—in every good way. This past Saturday, we had to put Charlie to sleep and usher his one-of-a-kind dog essence and energy into another realm. He’d been struggling for over a year, finally having lost all use of his legs among other pain points he was dealing with. Charlie was 100% at our mercy, unable to do anything for himself anymore. Relieving him of his suffering even though his spirit was still alive and full of love for us, was the right–albeit absolutely grueling thing to do for him. 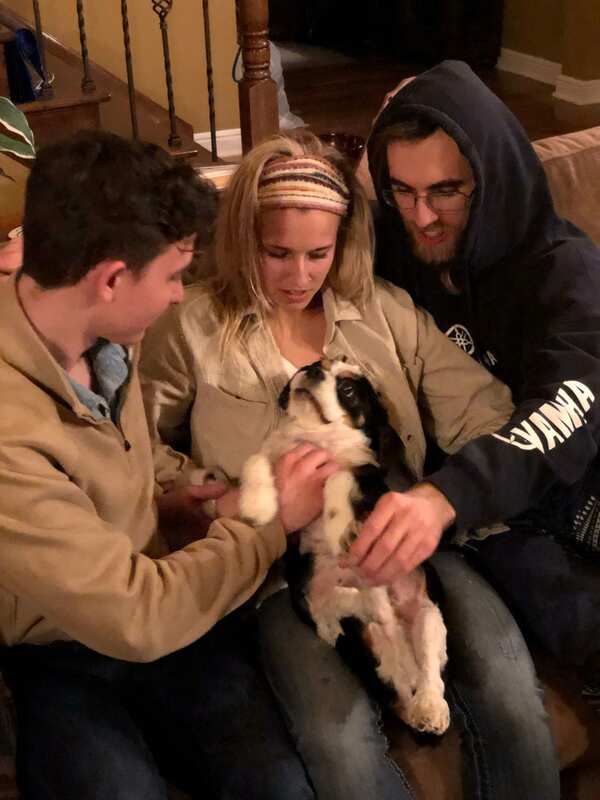 My three adult kids came home for the weekend to spend their last moments with their incredible four-legged sibling. Charlie was passed from kid to kid for warm snuggles and long goodbyes. All three of my 20 somethings slept with Charlie the night before our goodbye on the king bed in the spare bedroom in such a way that all three of their faces were next to Charlie. I didn’t get to see this, but just the idea of them surrounding Charlie in a circle of love melted me into a puddle. My mom heart felt things this weekend I’d never felt before. A rawness that can’t be put into words, and yet another example of how the love we have for our kids and the emotions that well up in our heart can never be fully comprehended or predicted. There’s no end game for all the feely stuff we deal with in mom life—the swirl of emotion just keeps expanding and filling our soul with every passing experience. 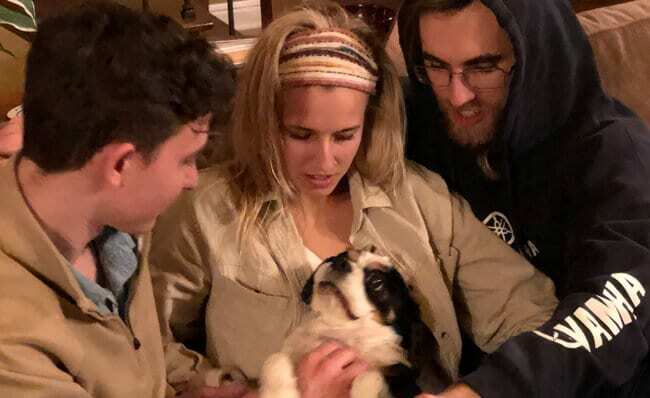 All five of us took Charlie to the vet and laid hands on him in prayer as we watched him transition to another dimension. It was agonizingly peaceful to “walk him home” despite the heart wrench of having to say goodbye. God and Charlie gave us this gift of a tranquil exit in which all of us could be at his side. But the real impact of losing our dog this weekend was the tangible reminder that we will lose those we love. We will not be able to rewind the clock and right the wrongs. Or get a do-over on all the ways we take for granted those we care for. All we have is NOW—the present moment to enjoy all God’s given us. We only have NOW to forgive, make amends, say, “I love you,” say, “I’m sorry,” write that letter, plan the visit, take the trip, make the sacrifice, and ultimately JUST LOVE. NOW is all we have mommas, That’s it. Dogs have an uncanny way of keeping us grounded in this truth. They live in the present, unburdened by the stream of consciousness filled with worry, angst, fear, resentment, anger, doubt, confusion, frustration, etc. like we humans battle with daily. Dogs just love. Dogs just love. Dogs just love. This post originally appeared at Shelby Spear, Finding Grace in the Mishmash, published with permission.